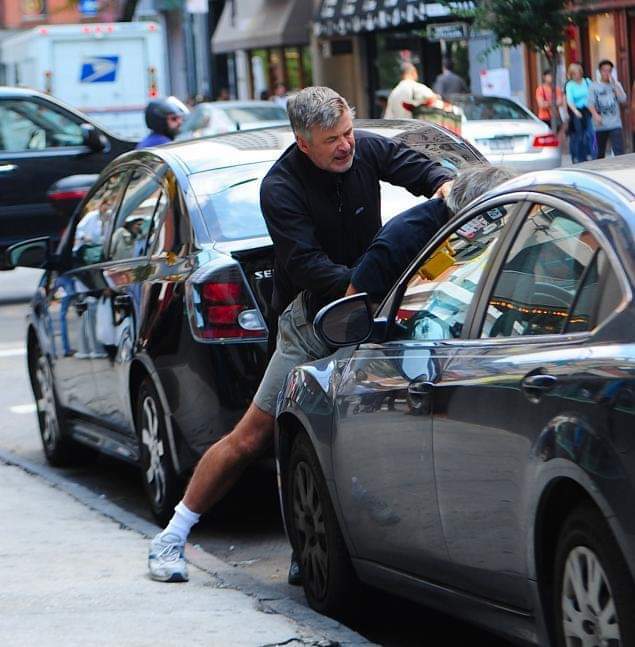 Yes-siree-bob, that’s Alec Baldwin your typical peaceful leftist, pounding the crap out of somebody because he wanted the parking space. This is the guy whose advise we’re supposed to be taking as regards presidential temperament. Now look, I know full well that parking is a real problem in Manhattan…. But that’s what Baldwin signed on for when he decided he wanted to live there. And by the way what he wants to rest of us to sign on for. We’re all supposed to be living in big cities to save the planet, remember. I think I’ll just leave that there. If Saturday Night Live had a sense of humor they’d get Donald Trump to play Alec Baldwin in a sketch tomorrow night. There isn’t a lot you can expect from people who earn a living by pretending to be someone they are not. Eventually it screws what limited brain there is available. Then again, I’m old enough to remember all those Jonnie Carson interviews with actors talking about their shrink helping them to find themself. Egads, you are old. You remember when late night television was funny. Now what was in the hermetically sealed mayonnaise jar? Are you referring to the Number 3 Mayonnaise jar kept on Funk & Waganel’s front porch David? That jar contained the envelopes for Carnac the Magnificent to divine the answers to of course. I also remember Joe Pyne and his antics. Then later on there was a local guy called himself Part Time Eric who had a decent set of pipes on him but he went down the drain eating 12 hour old scrambled eggs at a Nelson Rockefeller event at the Regional Market. Hadn’t been for them eggs that kid might have amounted to something. Just to make it easier for you David I also remember walking across the giant sound stage at Chanel 5 where Tom Decker faked it from one corner of, and Trudy McNall did her cooking show from the other side of while they tried figuring out what to do with TV. How about Pat Torpey with her guitar and accordian LIVE? The giant Remote truck that parked in the same spot on S Winton Rd till the tires rotted off? How about when Chanel 10 finally got on the air WHEC signing off at 1845 so WVET could share the license. Remember stores selling TV sets in 49 when they were available even though nobody was broadcasting in Rochester? Sentinel TV? Eric didn’t pop up for a while, might have been 3 stations on air when he came along. Where did you jump on David?